Sassy Cheryl's Digi Stamps Challenge Blog: Sassy Cheryl's WINTER HOLIDAYS Digi Release & BLOG HOP!! Sassy Cheryl's WINTER HOLIDAYS Digi Release & BLOG HOP!! Ho ho ho! Are you ready for the winter holidays? If not, you will be soon! 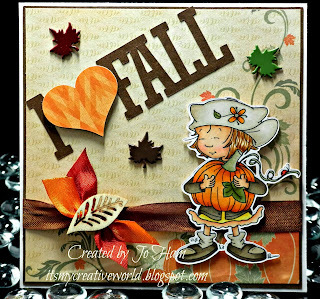 What a fun fall scene you've created! Please email Sassy Cheryl to claim your digi prize! Isn't Max so adorable with his warm scarf and mittens...and mug of hot cocoa? Oh...and just wait 'til you see the rest of these new digi images! You're really in for a treat!! Today's six brand new, never been seen, Sassy Cheryl "Winter" digi images are currently available right HERE at Sassy Cheryl's Online Store! There are also pre-colored images for sale. And, here's something extra cool...for a limited time, all of these cutie patooties are available at special discounted prices!! Be sure to leave comments along the way...AND on Sassy Cheryl's Challenge Blog HERE at the end of the hop...because several lucky blog hoppers (selected at random from the comments) will receive some fabulous Sassy Cheryl prizes! Your next stop along the way is the very clever (and sassy) Miz Dawn HERE! Thanks so much for "hopping" by! Have fun with the rest of today's Winter Holidays Blog Hop . . . and, of course, have fun shopping at Sassy Cheryl's!! The link to Judy's blog doesn't seem to work for me. Okay...so duh...I guess this is where Judy's image is...LOL !! What a lovely image Judy...love the colours your used and it sure makes me wanna have a hot cup of cocoa !! Thanks for sharing and inspiring, as always. Great blog hop !! Ok, not sure if this is where I post on Judy's as link took me to PCP page..
Love the card and that image is adorable. WOW CHERYL...and all the Sassy gals...what a fun blog hop (but I was experiencing technical blogger issues - ughhh)...LOVE'D THIS BLOG HOP...you have such a talented DT Cheryl...and of course you are UBER-TALENTED yourself...always amazing and inspiring. Thanks so much for sharing these wonderful new images...just in time for Christmas card-making !! What an enjoyable hop this was! Kudos to all the ladies and I do think shopping is in my future. Wonderful images Cheryl! Especially fond of Max and Maddie with their Christmas trees. He is adorable - and although I am not ready for the winter at all, I love the image! Now I am on to the blog hop - wishing you a happy day! First off I had to go check out the new images, and I LOVE THEM ALL! Great job Cheryl. Now I'm off to see what the DT has cleverly created with them. Congratulations Jo, on the win. I love your card. Wonderful blog hop - so many inspiring creations! I love the Charlie Brown images - my favorites! Thank you all for sharing! Judy, love your winter card! Great image. As usual...Judy's card is off the charts ADORABLE!! Max is sooo cute! So beautiful card Judy. Love how Max peek out of the card. Your coloring is awesome as always. Love trees and snowflakes. I really enjoy looking at your cards! I like Warm Winter Cacoa- Maddie. Such a cutie! What a stunner Mz. Judy! Love it! Great hop and love all the new winter releases. Hard to pick a fave! Great inspiration and talent from the DT! Ouch, don't burn yourself! Really cute image, love your card! well done my dear... makes me want some cocoa this morn instead of my usual coffee... Thanks, can't wait to "HOP"... Marcy E.
Oh so very cute! It makes me want a cup of cocoa. Great card! How fun, a hop during the week. Love Judy's card, the coloring is out of this world gorgeous and love the dies used. What a great card. Cheryl, the new images are fabulous. I hopped along the way and was definitely delighted and smiled all the way through on this winters blog hop! Super great job ladies, as always never disappointed! Cute card Miz Judy. He is adorable. Love the brown and blue color combo with the touch of red. I am off to see the rest of the hop. 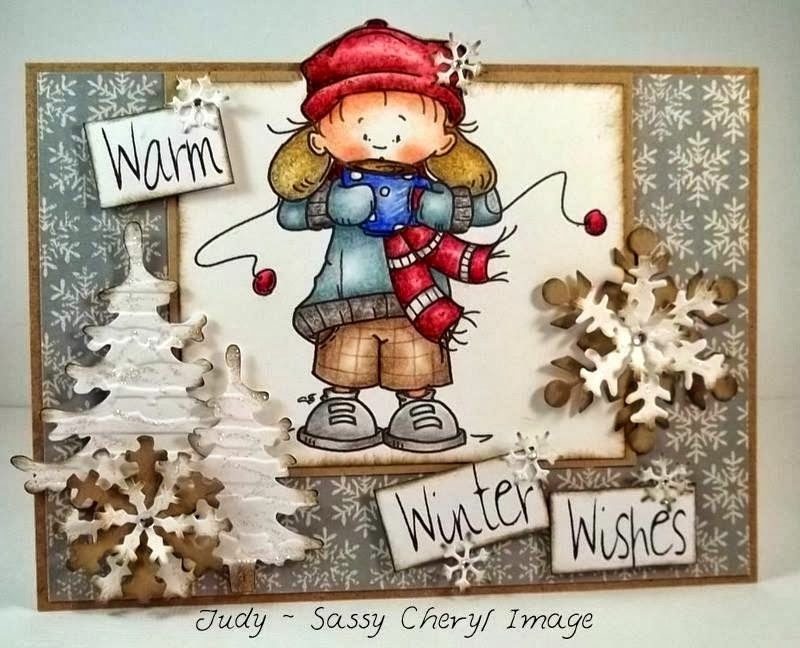 Fun, Fun, Fun Judy, Your use of colors and background are fabulous for conveying the coldness of the season! FABULOUS! What cute cute cards! I love the new images. Darling! Cheryl, as usual your DT has beautifully designed some amazing cards! Warm, cold, festive, happy and above all fun and thoughtful! I just completed the hop and was so impressed with all the team's creations. My favorite image is the little girl holding the mug - is it called Warm Winter Cocoa Maddie? Just finished the hop. So many wonderful projects. thank you all for sharing. Very cute card Judy~ of course I knew it would be!!! love his little plaid pants, and those rosey cheeks. The images are all soooo cute. I love everyone one of the new images. Wake up paypal account :-) Judy your card is so sweet. I love the die cuts you have used with the adorable image. Also thank you for the win. Cheryl- you know I wanted all the images even before the blog hop's start!!! I am however, completely in LOVE with "Max's Charlie Brown Tree" !! What a fun way to start my morning. All the sassy DT gals did a MAGNIFICENT job. Awesome Blog Hop Sassy Girls.. what fun!!! AWE Judy's card is Fabulous along with all the DT on the hop!!! What Fabulous creations by all!!! Super cute new digis Cheryl!!!! Finished the blog hopping and hope you do this again! Wonderful cards and gives me lots of inspiration to try some new things~ washcloths, tracing paper, snow stuff.... I think I'd have to say my favorite is (since I can only pick one) would be the Max's charlie brown tree. I love his expression~ off to buy me some new sassy cheryls! Judy, Judy, Judy, this is amazing as usual. I always show people your cards as an example of what they can do with colored pencils. You are a master sweetie. I love this color scheme. Max looks so cold. Congratulations Miz Jo. I am so happy this card won. It is de bomb!!! Cheryl you aced it with these images for sure. I want them all.........This hop rocks! Wow, great hop. I would not want to have to pick a favorite cause I love, love, love all the new images. Thanks for the great new designs. Ok, been the hop and now Pat says to pick a fave, not a easy task. I adore them all, but love the Wind in My Hair! Why choose, just want them all! Thanks for a great hop ladies, the cards couldn't have been more beautiful. Hi Judy - I forgot to say how much I like your card. So sweet. Isn't he cute!! Loved the hop! The DT did a wonderful job showcasing the adorable new images! I think my favorite is Maddie's Charlie Brown tree. I mean really, who doesn't love a Charlie Brown tree!! this little guy is so cute all bundled up, and drinking hot chocolate. He is so adorable...so cold..clutching his hot chocolate!! Fabulous card & coloring!! Just finished the hop!! All the DT's cards were over the top as usual....fantastic job!! Great card Judy! Youth your creations always amaze me!! Tolle Karte und Tolle Idee. Oh Judy, I have jumped through hoops to get to here LOL. I think I have registered properly. I want to say how much I love your creation, you never fail to inspire me (or cost me money ha ha). I MUST buy all of these new incredible stamps right now!!! Adorable design, Judy. Max is a cutie! Great hop with tons of inspiration! Hard to pick just one, but I really like "Warm Winter" with that huge cup of cocoa and sweet expression that Maddie is showing. Wow, love all the gorgeous cards the DT has created with the awesome new images! So hard to pick a favorite...love them all....but I really love the Charlie Brown tree ones! Thanks for a great hop & all the inspiration! I looked over all of the DT cards, and loved every one of them! Beautiful images and a great blog hop! LOVE your card Judy - I adore Max and his hot chocolate - wonderful sentiment too!! Judy, I adore this card! The coloring is perfection! Too cute! very cute image with an adorable card! What a cutie this new Sassy image is! FABulous colours Judy..I LOve your design. What a FABulous new set of Sassy images!! I can't pick out any one that I LOve the best lol...I LOve them all...Such sweeties. Thank you ALL for a great Blog Hop!